BRP’s Ski-Doo Freeride Ambassadors program is entering its second year and brings a new perspective with the addition of two women riders, Ashley Chaffin and Stephanie Schwartz. This group of talented riders will once again be sharing their ride experiences, thoughts and opinions on everything for the deep powder market of western North America. 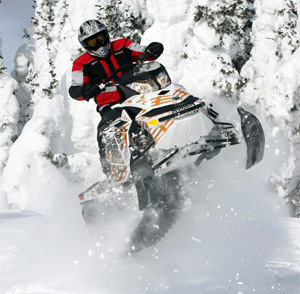 For those unfamiliar, the Summit Freeriders are this year comprised of seven mountain snowmobilers with a wide range of riding styles, riding interests and unique talents. A couple of them are seen in some of the extreme back country videos, one has an impressive collection of X-Games medals, one is a former racer and another is an adventure athlete who has competed in almost every kind of human powered race there is. It’s a wide range of people who can offer something for all riders. But they all share a passion for mountain riding. Last year the Summit Freeriders gave you some great insight on what they’re up too all winter long – how they prepare before the season starts, the gear they use, sled set-up and some great riding tips – that will continue this year and you’ll get the added benefit of a women’s perspective. 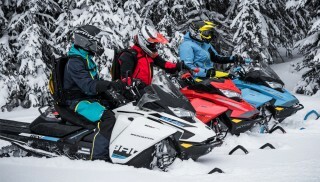 The Freeriders will appear at the western snowmobile shows this fall and watch the Ski-Doo Mountain blog Elevation or Ski-Doo Mountain Face Book Page for updates on where they might appear at select dealer events and demo rides. Calvin Felker: Fort Collins, Colorado, extreme mountain rider, former snocross racer, mechanic extraordinaire. Currently works at the family dealership and has hand on the pulse of the market. Rob Hoff: Alpine, Wyoming, extreme back country rider. Appearing in eight films over the past 3 years, has a passion he wants to share with others by riding with them.